Karl Gerich was a great admirer of playing cards produced by B. Dondorf and his tenth pack was inspired by Dondorf's Luxus-Spielkarte Vier-Erdteile (Four Continents Luxury Playing Cards) designed by Friedrich Karl Hausmann, 1870. 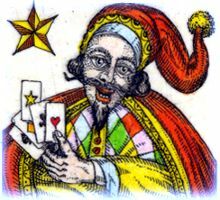 The pack has double-ended courts showing exotically dressed figures from different parts of the world; pictorial aces and a double-ended Joker-Magician. 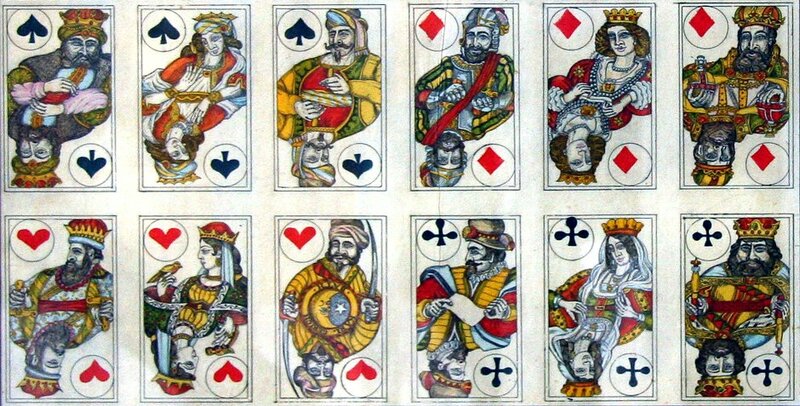 Above: four Aces from Karl Gerich's playing cards no.10 "Four Corners of the World", 1984. Copper engraving, hand coloured by Karl Gerich. Images courtesy Barney Townshend. Above: court cards from an uncut sheet of hand-made playing cards by Karl Gerich, '4 corners of the World', 1984. Cards measure 44mm x 76mm. Images courtesy Barney Townshend.